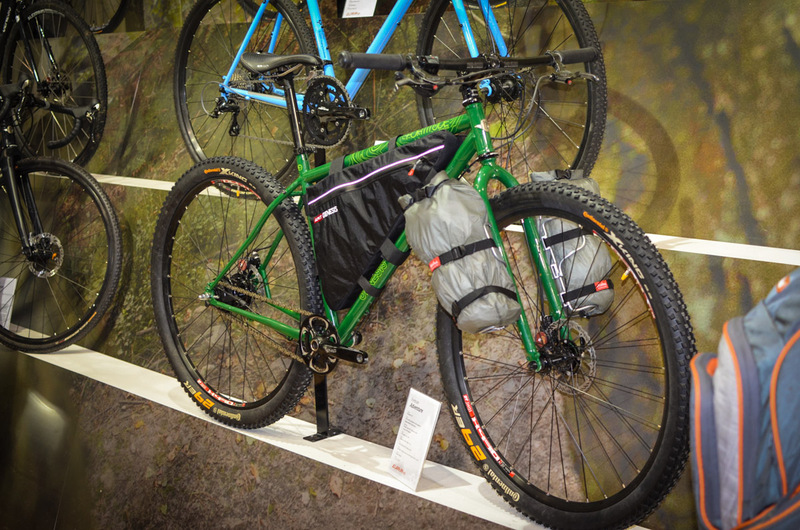 Saracen Kili Flyer. 120mm full suspension 650B bike, 130mm fork up front. ISCG tabs. Very much in the vein of ‘long top tube, wide bars, short stem’ modern trail bike. 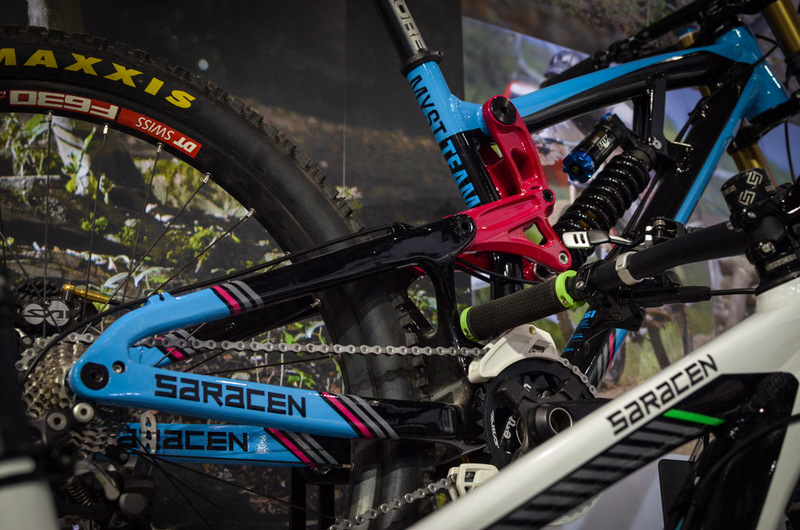 Very similar geometry and main pivot placement to the Saracen Ariel. 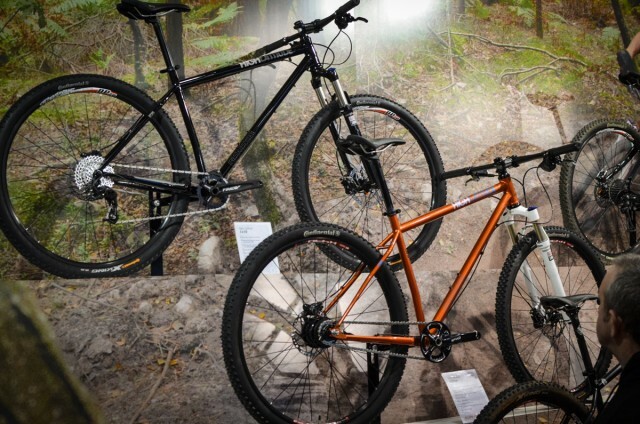 So based around fast trail riding with fun handling and elbows-out shape-throwing. 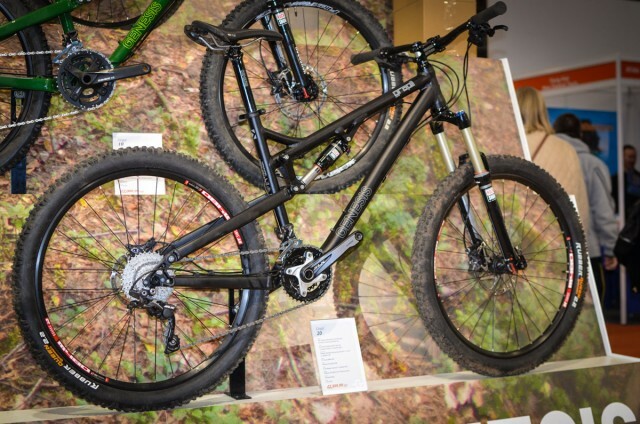 Swinglink is based on the Saracen Myst downhill bike, scaled down. Some very nice crisp machining on display here. What’s this hole in the seat tube? It’s for routing the hose of a Reverb Stealth ‘dropper post. The seat stays look very ‘Intense’, apropos of nothing. 27.5 = 650B. 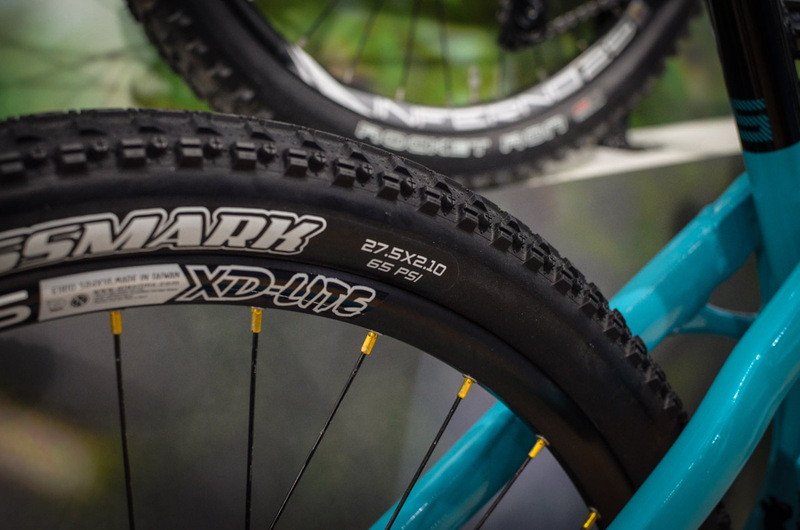 Maxxis rubber all round (groan). Crossmark rear, Ardent front. What else do we know about the Kili Flyer? 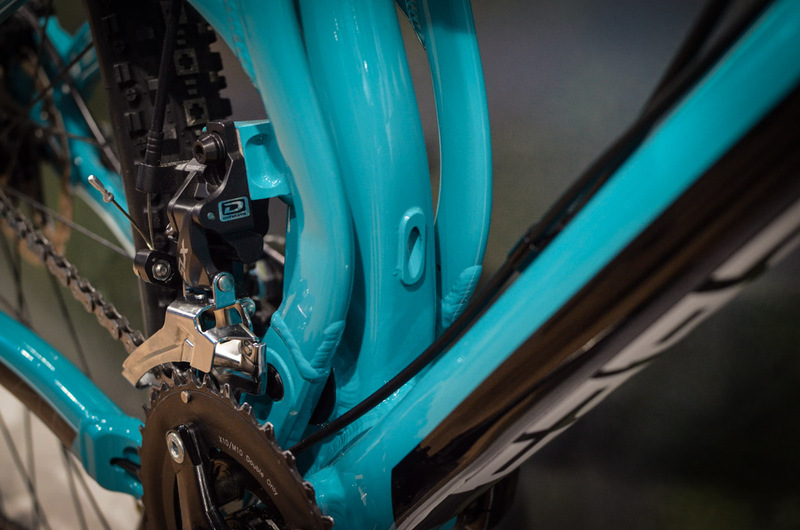 Direct mount front mech. Norglide bushes. 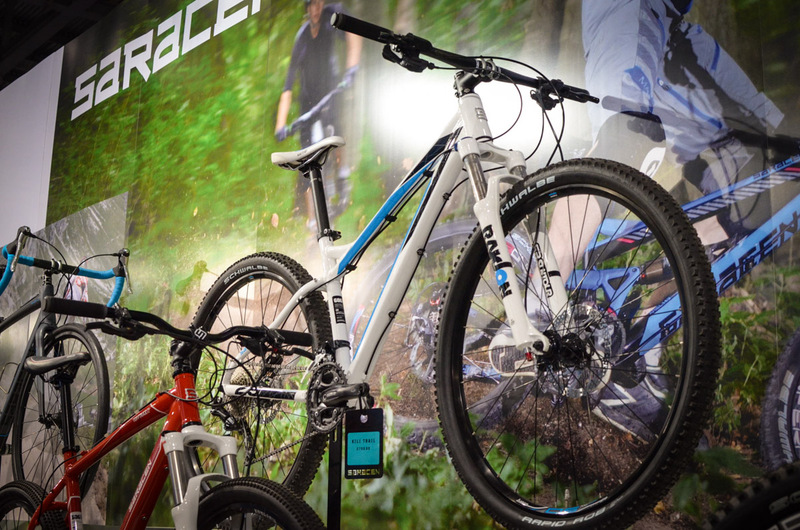 Available as a frame only for £1399 or full bike for £2799. 650B-sceptic riders have been Strava-ing siginificantly faster times on this 30lb 650B bike than their usual 26lb 26in bikes. 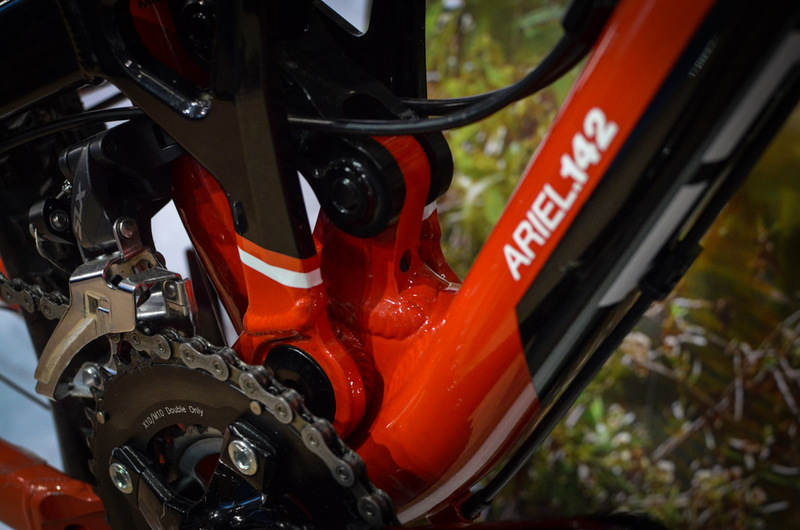 One of our favourite ever bikes, the 140mm Saracen Ariel. Pretty much unchanged geometry wise but the frame is now made from 6066 aluminium for more strength but same weight as previous Ariels. The new Ariels have entry ports for Reverb Stealth ‘dropper posts. Saracen Kili Trail 29er. 69° head angle, which sounds encouraging for a £799 bike. The swingarm of the Saracen Myst downhill bike is now made from carbon fibre resulting in 400g being lopped of the frame weight. Genesis time. Thankfully not the Phil Collins backing band. 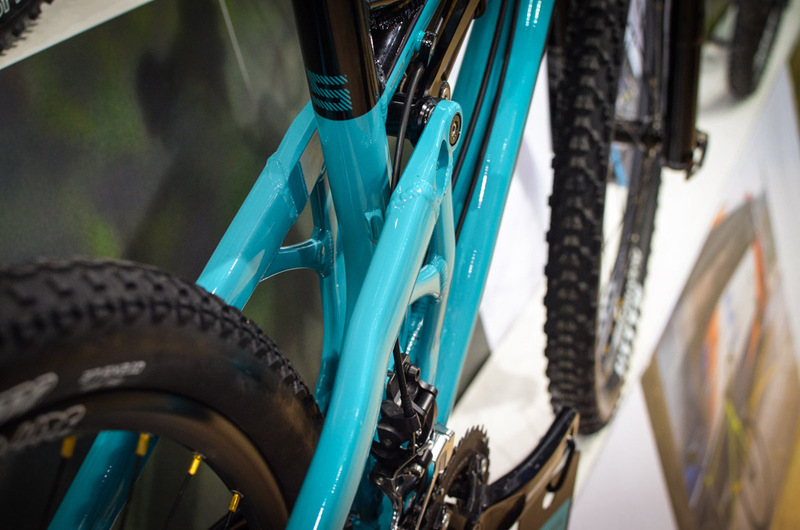 Genesis range of steel 29er hardtails has been expanded to now include the High Latitude range. Their Fortitude 29ers are rigid fork specific, these High Latitudes take 100mm suspension forks (the 16in versions come with 80nn forks to keep the fronts appropriately low). The head angle is 68.8° (69.5° on the Fortitudes). Another difference on the High Latitudes is that their seat tubes are kinked rather than rolled/crimped on the Fortitudes. 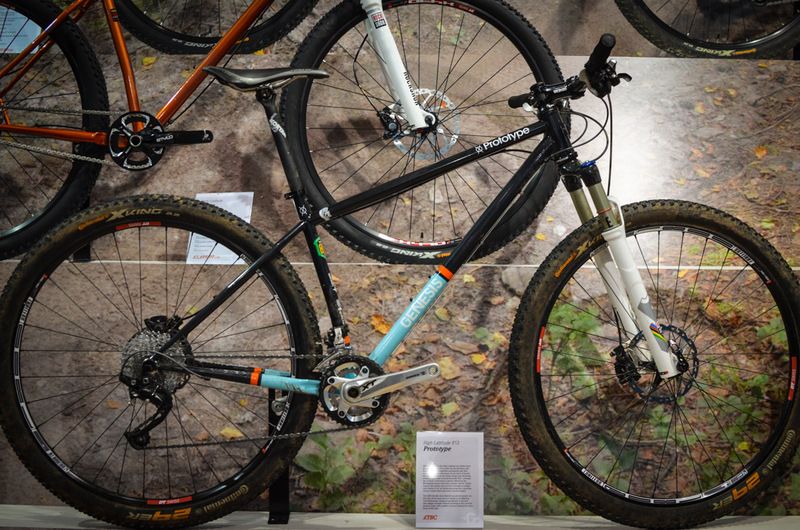 The black one is the 1×10 High Latitude, £999. The orange one is the Alfine 11 High Latitude, £1699. Both made from Reynolds 525 tubing. Swish! The Genesis High Latitude 853. Made from, you guessed it, Reynolds 853 steel. Reynolds’ DZB top and down tubes enable the frame to do away with strengthening gussets. 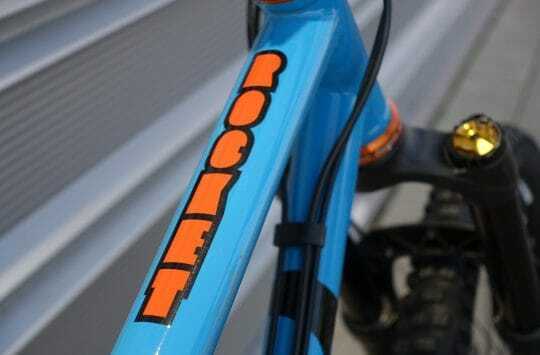 Reynolds 853 sticker. And lovely paintjob. The Fortitudes are still very much in effect. Here’s a fully laden one. Ready to brave the snowy wastes over to Sainsbury’s. Genesis Grapil in the lesser-spotted anodised finish. 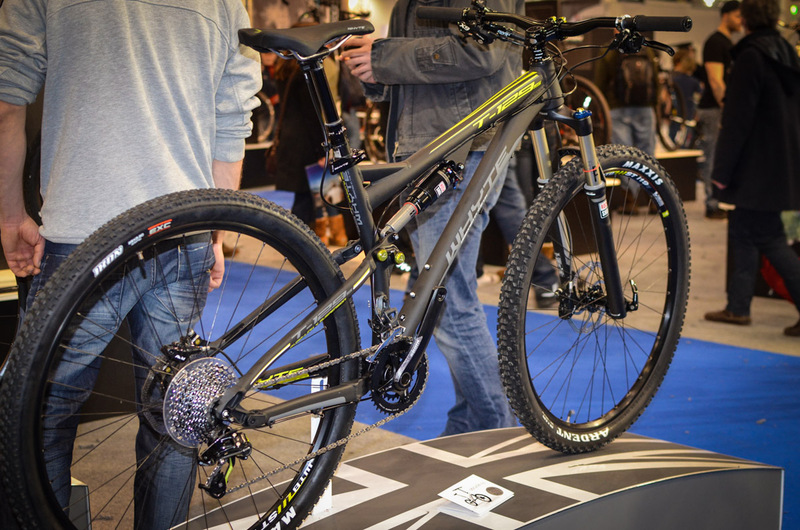 120mm rear travel, 140mm forked ‘very British’ bouncer. 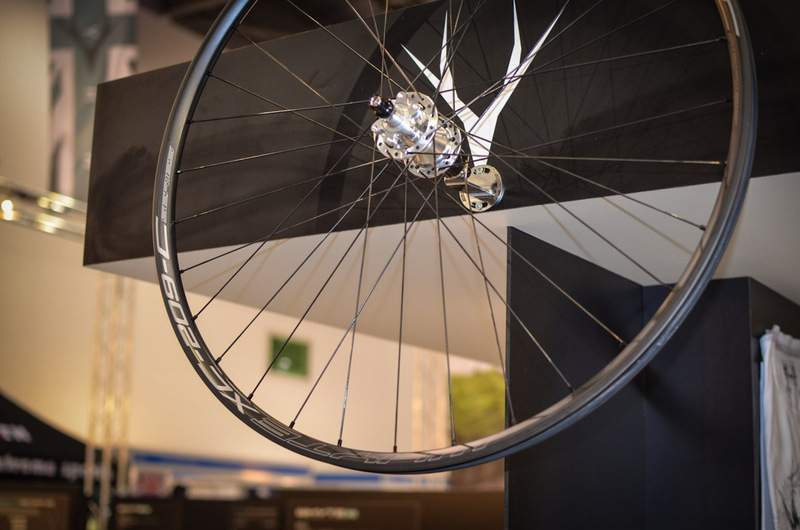 Whyte wheels. Whyte are bringing in their own carbon wheels. They’re not exactly ‘cheap’ but at about £1000 for a pair they’re about half the price of some other offerings. Available in XC and Trail versions. Wilier. Who? They’re a 105 year old road bike brand. They’re branching out into mountain bikes (uh-oh). But we like this 101XN semi-prototpye bike, if only for being so unique. 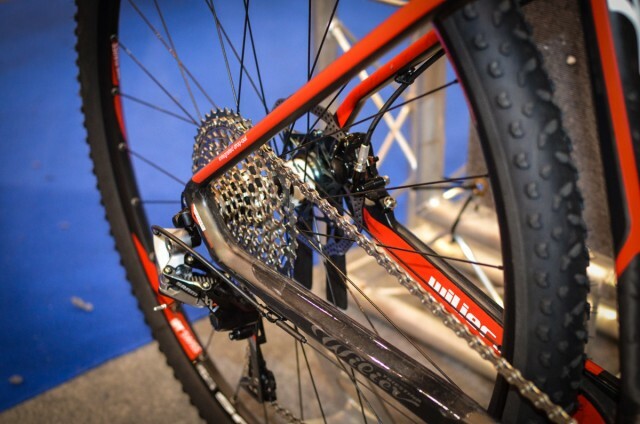 A fully rigid carbon 29er with SRAM XX1 drivetrain. That silver threaded hole is for attaching an ‘IFP’ device, essentially an anti chain dropping/gouging plate. The internal cabling is easily installed/removed by removing the large bolt-in port junction. 1, 2, 3, 4, 5, 6, 7, 8, 9, 10, 11! 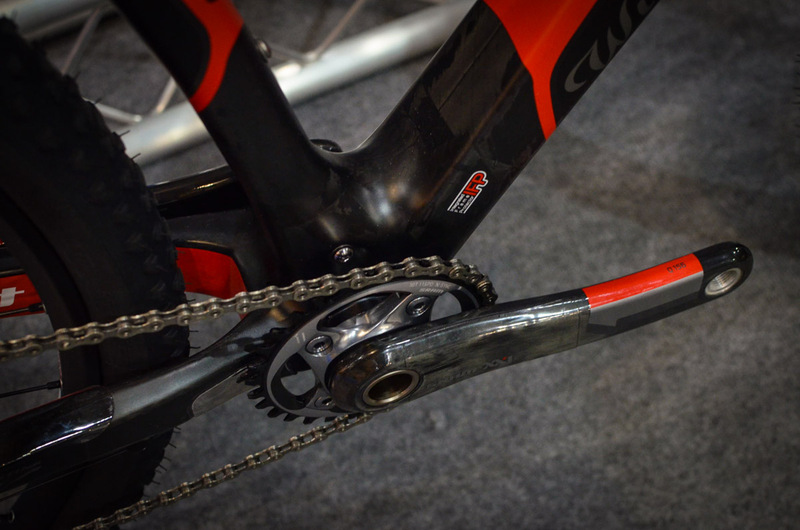 Note the chainstay mounted disc brake too. 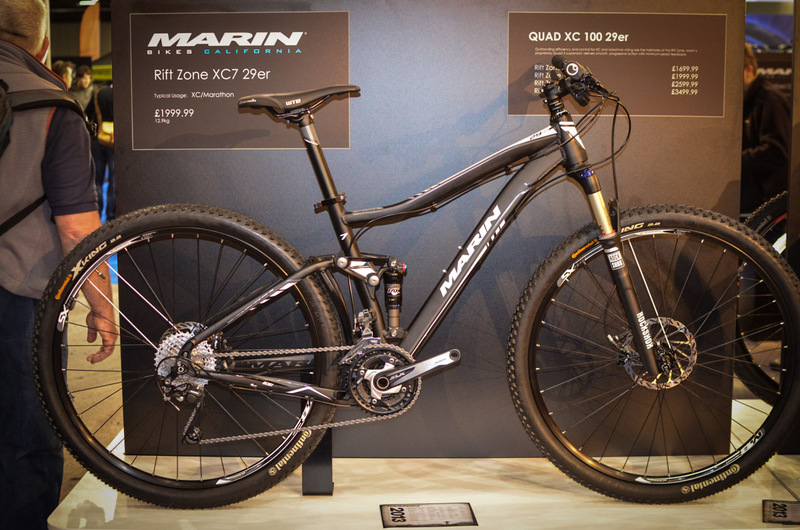 Marin Rift Zone XC7 29er, as you can see from the handy backboard. Marin Team CXR 29er. 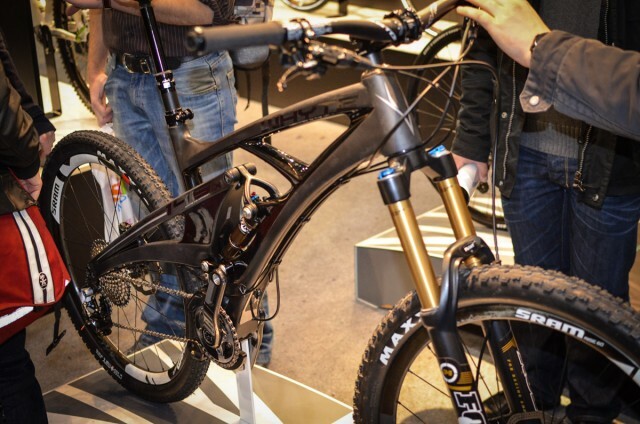 Carbon hardtail big wheeler. Marin have recently been bought out so expect to see some fairly significant changes come 2014. 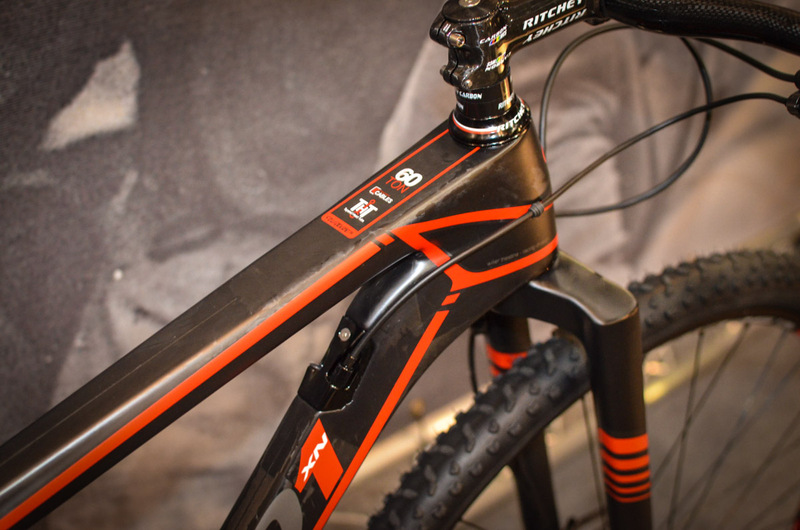 Whyte T-129. 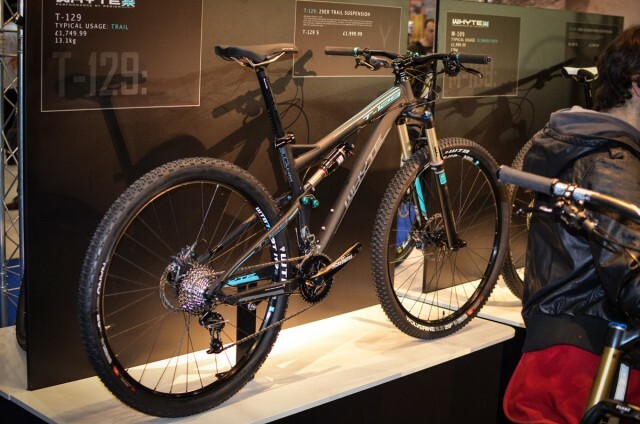 There’s already a big buzz around this bike within the bike industry/media. Apparently it’s fast-as-flip and just loads of fun. 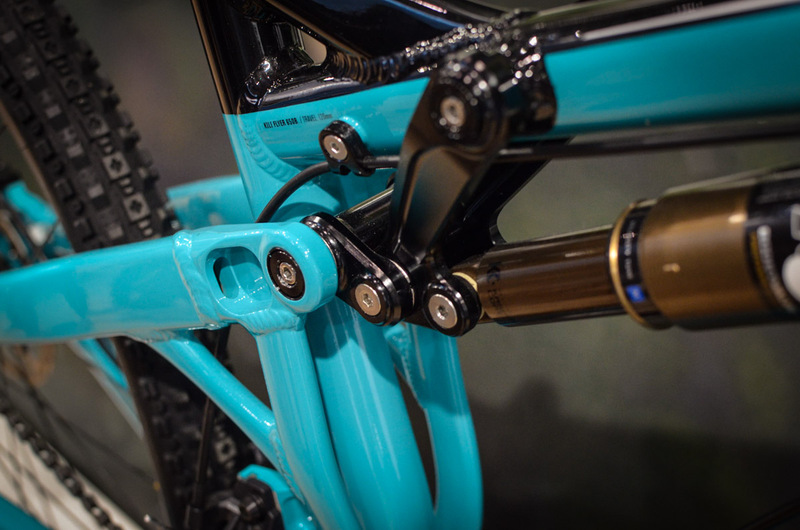 120mm 29er with progressive geometry and suitable finishing kit, for once. Can we have a go on one please? £2000 for this nicely specced (Reverb!) model. 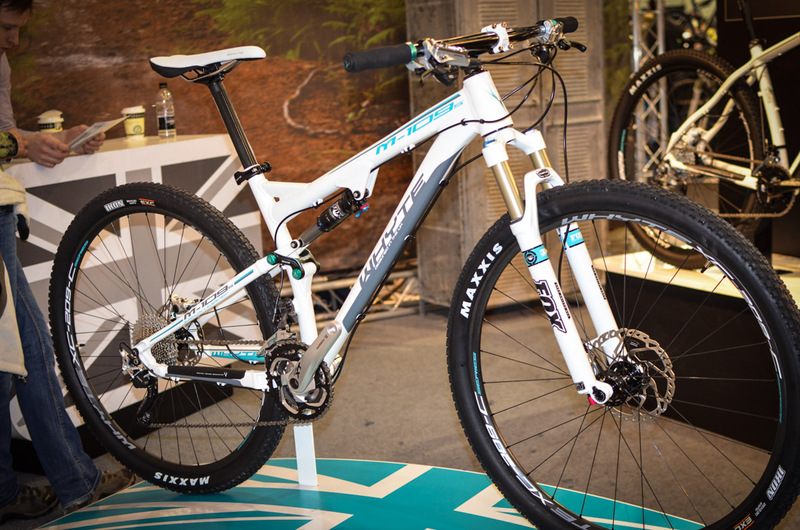 Whyte M-109. 100mm 29er. Slightly more restrained geometry to go with the modest/short travel. Available in £2000 build and a £3000 build with carbon wheels and stuff. 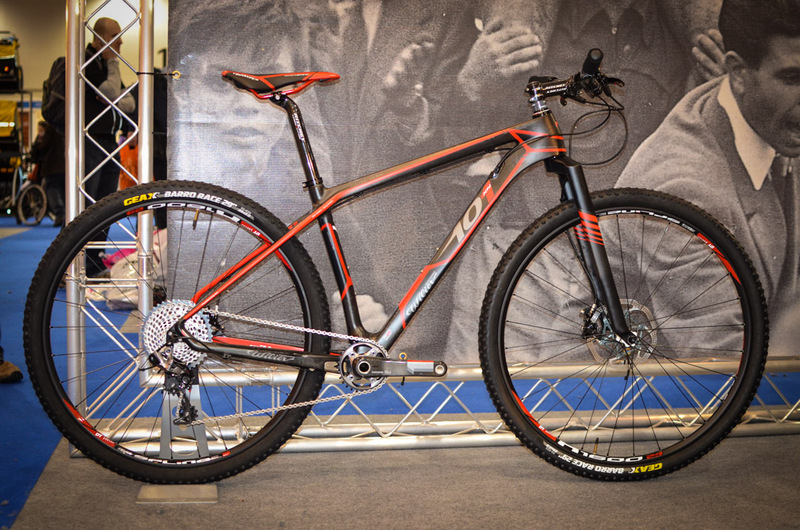 The drool-covered Whyte T-129 is also available in a £1799 build. WANT. Sorry. 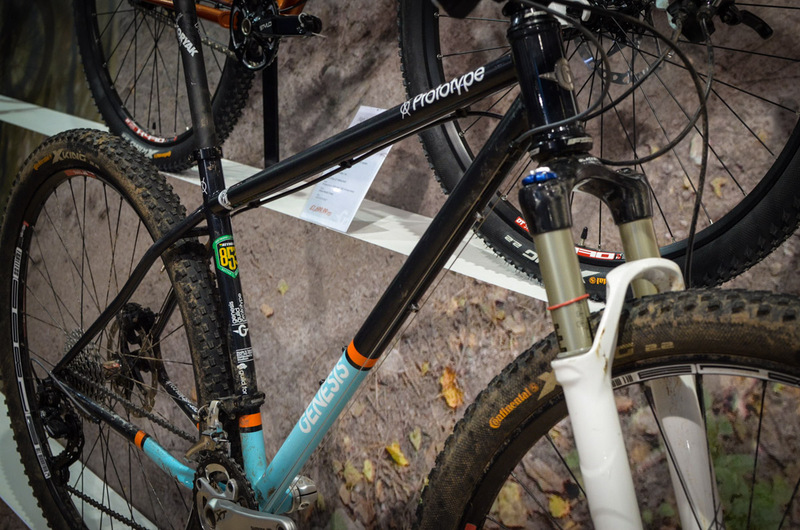 The classic Whyte 146. A few tweaks to the 2013 version. Mainly the introduction of a strut/brace between the top and down tubes. 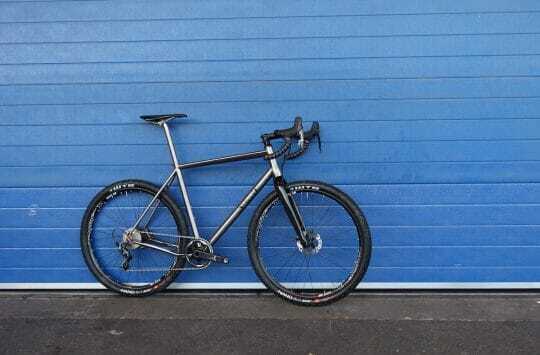 Available in an ultra-bling £5250 build with SRAM XX1 drivetrain, 750mm Easton Havoc bars, RockShox Reverb Stealth ‘dropper post and so on. 24lb. Still has the usual lifetime warranty on the bearings. 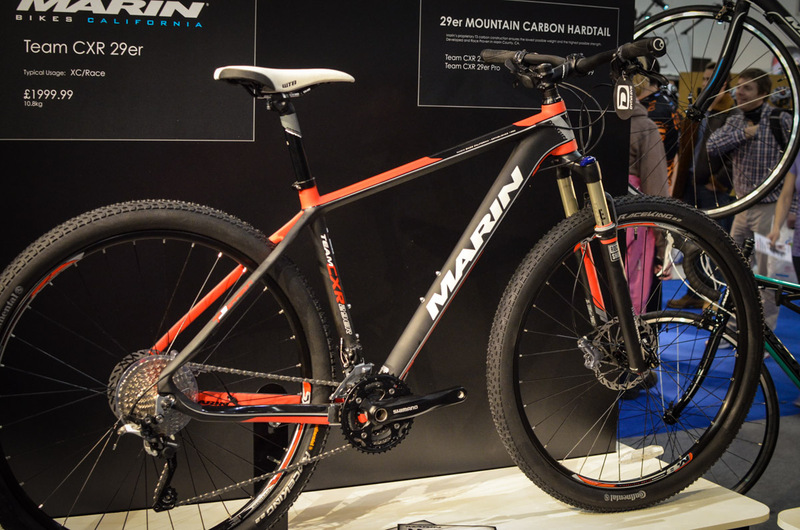 Had interesting chat at Marin stand. 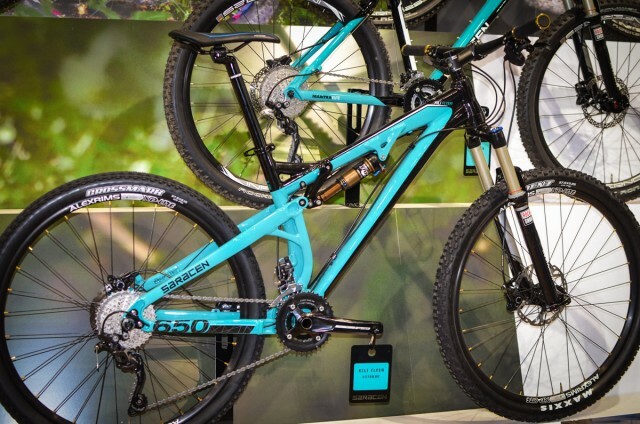 650B (? I think?) coming next year. 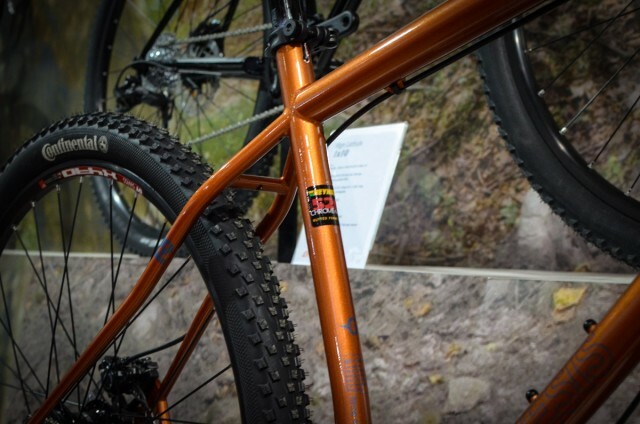 26 hardtails dead by looks, for them anyway. Who set a show XC bike up with that saddle angle? Yay ! the return of Saracen cyan. Love the look of that Killi Trail… I may actually be tempted by one as they are so much better value than a lot of the stuff I have been considering. 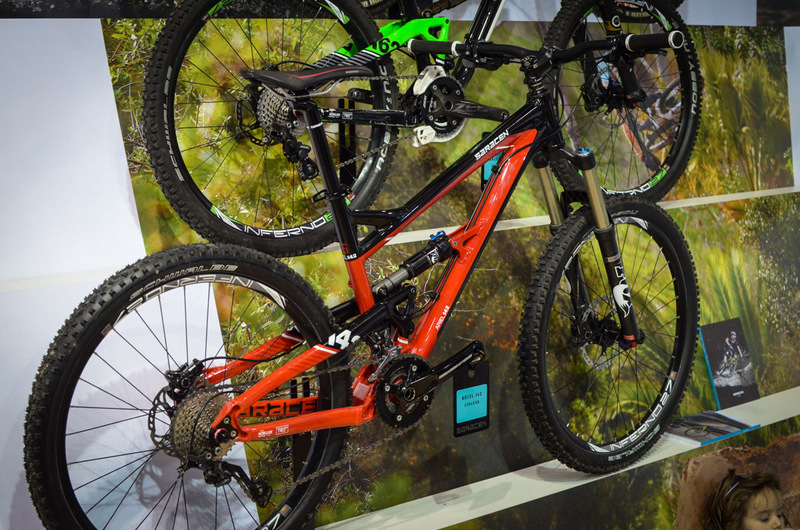 The Whyte stand has got me wondering… is that where my large 129S has got to eh…. Roll on March 1st. Argh! Pretty bike overload! New Genesis HL looks superb! I thought that too MussEd. Too good to be true? I’ve got the whyte t129s and am really pleased with it. Really gives confidence and just seems to take whats thrown at it.